In almost 12 hours I will be standing before my committee and hopefully no one else other graduate students and my professors defending my thesis! Yep sounds just like what everyone wants to hear about at 8am in the morning huh 😉 well I am getting excited and nervous… I get choked up when I speak in front of people I know really well sometimes. Which means that tomorrow pretty much all my peeps and best friends in the department will be there supporting me, I appreciate it a lot but at the same time hope I do ok. I have been getting tons of good luck texts, emails, and such from my Alltech crew, Aarons family as well as friends and family from back home!! Got to love the sweet people I am blessed to have in my life! 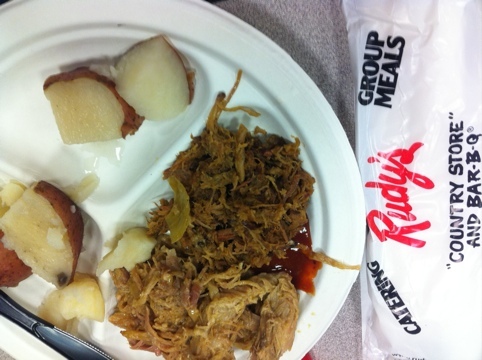 On another note as a graduate student in the department, we all enjoyed some awesome Rudy’s BBQ for lunch during our AECGO meeting today. We had a great meeting, actually the best meeting I have ever been to- we discussed our different research topics and how we could work smarter not harder. I am excited for the rest of the group and their ideas for the coming semesters. Hard to believe I am almost done!! Praying for a fluid defense tomorrow and many blessings to you all! Posted in Gluten Free, Just Jessica, Main Course and tagged gluten-free, rudys BBQ, Thesis defense. Bookmark the permalink. I am coming! Let me know if you want me to bring you some coffee, you will rock it! You are so sweet, Just a dose of confidence with a shot of fluidness 😉 thanks!!! !